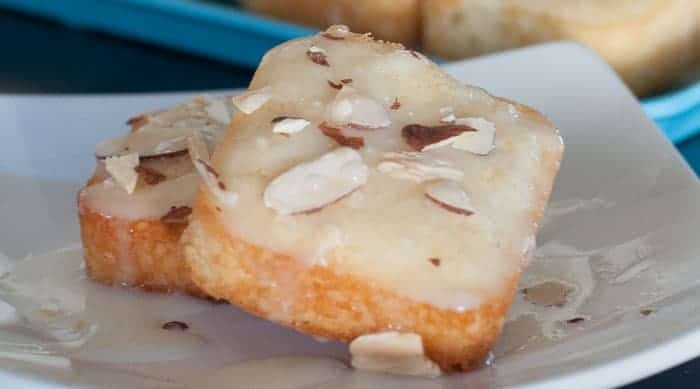 A mini version of a Norwegian almond cake. Quick and easy to make. Tastes and looks like it takes much more time. With the delicious almond flavor and crunchy, textured edges this cake is always a hit! Miniature versions of foods are my favorite. 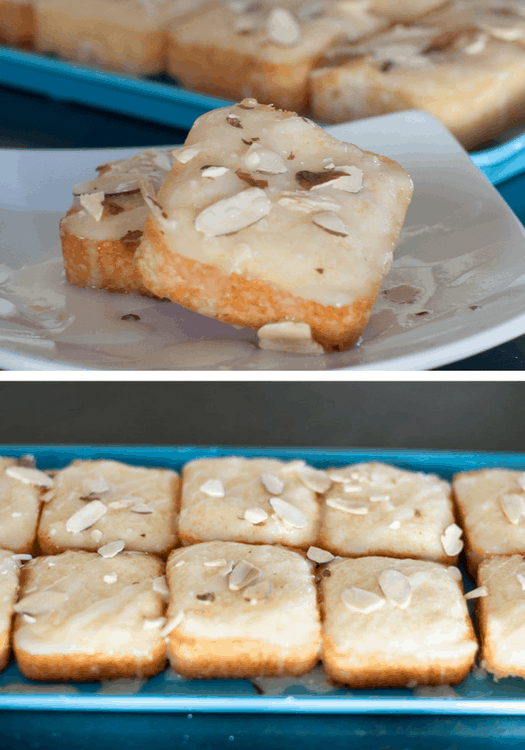 This is a mini version of a delicious almond cake, one of our family recipe favorites. With the delicious almond flavor and crunchy, textured edges this cake is always a hit! Our family often makes the full cake for special occasions (i.e. weddings, rehearsals, baby and bridal showers) or Christmas. It’s so easy to whip together and it tastes like it takes a lot more effort. We typically make this recipe in a Norwegian/Scandinavian almond cake pan. However, for the recipe I am sharing today is made in a mini dessert pan or brownie bar pan. Combine the sugar, egg, almond, and milk in a medium-sized bowl. Beat well. Add the melted butter and make sure all ingredients are well blended. Grease the dessert/brownie bar pan well. Scoop about a 1/4 cup of batter into each square. Bake at 350 degrees for 20 minutes. The edges must be golden brown. Add 3 tablespoons of milk and 1/2 teaspoon of vanilla or almond flavoring. 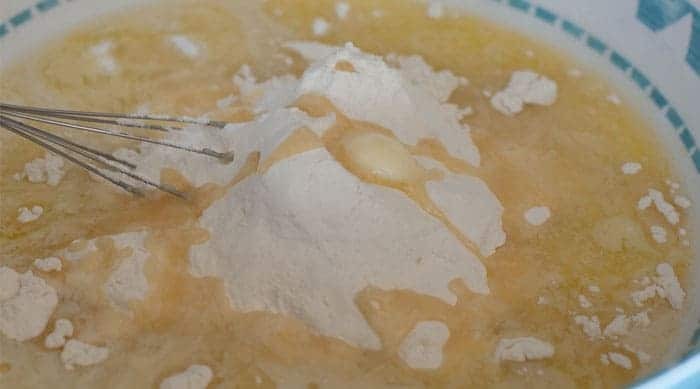 Mix in 1/2 cup of powdered sugar and mix well. It should be slightly runny, but you can add more milk or powdered sugar to get the desired consistency. Drizzle frosting over the mini almond cakes. Top with sliced almonds and add to a fun serving tray. Tip: if you want to make the full cake, reduce the flour to 1 1/4 cup and bake for 40-50 minutes at 350 degrees. Stop by and say hi in the comments! What is your favorite mini food? 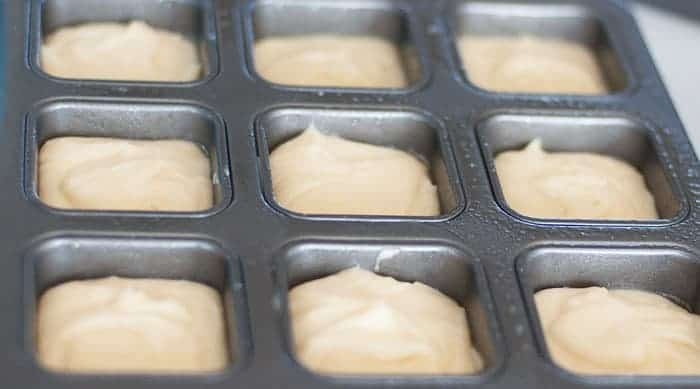 So easy and delicious, miniature almond cakes. A mini version of the Norwegian almond cake using a brownie bar pan. Grease the dessert/brownie bar pan well. Scoop a little less than 1/4 cup of batter into each square. Top with slices of almonds and add to a fun serving tray. 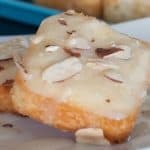 The glaze and almond slices are optional. You can also dust with powdered sugar. That is awesome, eating for three, haha! 🙂 I’ve had this pan since our wedding six years ago and just started using it. It’s nice to just pop them out of the pan instead of cutting them. I’ll be using it for brownies and other bars for sure. Thanks for stopping!